Poker strategy is never black and white, or one size fits all, and your poker game shouldn't be either. In order to excel and take your game to the next level, you need to know how and why to change gears or strategies while you play. It's all about adapting your play to the table and player dynamics at any given point in the game. But there is more to it than simply switching from a TAG (tight-aggressive) or LAG (loose-aggressive) or maniac style! As with all strategies, you need to have a plan. You need to know the how and the why of your gear changes so that you can make them work for you and accelerate your game! How do you know when it's time to change gears? What tips can you add? What was something new that you learned from the article? Comment below with your thoughts! A very good article Tammy. I know I'm known as a loose aggressive player. I will use this article to try and change this image into that of a tight aggressive player. I'm always trying to improve my game. This article has help me realize how loose of a player I am. Thanks again for the great article Tammy. Being subtle enough to change the image of your style in other peoples eyes, gives you a big advantage, but only against those with the clues to notice how you play. Good article. Although I feel I may already incorporate most of what I just read, I still picked up a few things. When to switch gears, when not to, and even helpful hints on possible ranges to consider. It was good to hear it from someone else's perspective for sure. I also think I put too much value in smaller pocket pairs. However I believe that cash game part of the article must be excluded. Many regulars are joining cash tables with 20-40bb stacks and play tight-aggressive game. Opponents feel safe calling my 3bets, cause my stack is much smaller and they know that it's maximum that they can loose in this deal. I do that all the time. Approximate 0% of Regs are changing gears at the cash tables with stacks above 200bb. Maybe 10-20% of regs are playing less tighter game vs some big fish. I think that the best thing to do before changing the gears is to study the field, specially if you're moved to a new table. If you're able to scan history of your opponents at Sharkscope and see who your opponents are - then this is the best thing to do before changing the gears. Cause if you're moved to a shark table as a chipleader and suddenly you've started to donk every hand just because your stack is big, then i believe that before the next break your stack will be much smaller, unless the fortune smiles and you'll be giving bad beat presents all around. I wish to read a good article about GTO strategy. It was and still is popular, many players are seeking for the information about it. The only thing I would add is : dont over-adjust and/or over level. this can be your own demise. I think a bit more math relating to the impact of stack size would be beneficial.. how much of your stack would you be willing to commit to changing gears? Sometimes it's just not feasible to do, especially in MTTs, depending on blind structures and how your opponents are playing. Sometimes your gear changes will be silent (only you will know) whereas in other cases you will be showing your villains how your play has changed. There are many layers to this.. but ultimately it comes down to whether there is enough time and enough chips to make the change. Another angle is switching gears back and forth depending on how your opponents are reacting to you. Best time to change a gear and your playstyle is on a late stage of the tournament. Not only the stack sizes but you also need to keep track of your opponents. You can adjust your playstyle depending on them by opening with raise if they're tight or double barrel if you feel like that they floating you. Very good article, Tammy. I try not to hurry at an early stage, I play in the style of TAG and always switch to the late stage! I think that the best time to change gears and your style of play is at a late stage of the tournament. When the blinds increase, it's time to make some change in the gears. I would say that hands like suited Aces and two-gap suited connectors like KJs or Q10s are good hands to add to our range. Of course when we have very little stacks, let's say 8 or 7 or 6 big blinds then we shove in the first good chance. Adapting your game according to the evolution of a tournament to the styles of your opponents is essential in your progress. It is good to change strategies at times. It is an interesting mental exercise if you put yourself in the place of others and also do a self-assessment of yourself. Hi, Tamme. Very cool article, but I try to stick to the constantly tight-aggressive game. Yes, I fully agree with you that a professional player must adapt to the game of opponents, but the player must also play with caution, since it is not always clear what the opponent may have. Staya good, try to stick with it. I'm constantly changing gears based on table dynamics, tourney stage and stack size. Problem is I tend to overdo it. Too tight to too loose and vice versa. The above can be successful but there have been many times I've kicked myself for being eliminated due to maniacal play. Time to try a smoother approach. thnx tammy for the article , it really helps me , i have learned a lot from this article , specially when to change gears , and if it s a necessary . very useful thread , thank you . I absolutely agree with changing gears, or as I like to call it, changing play style to better suit the table dynamics! Quite an essential skill to have in your asset if you want to be a very successful poker player! I would only add that, in my opinion, it is not as much about being a harder book to read, as it is about adjusting to your surroundings and specific players at the table! Interesting article. I think that in a subconscious level we all do change gears while we play, whether on account of getting deeper in a tourney and nearing the bubble or our stack slowly blinding out (we nits do have that problem). Doing it consciously and utilising it as a tool is a very good step forward in our game. Yeah, at the beginning you play and raise with good hands. Then when everyone understood it you start bluffing. Then some mix when noone understands what you have. But really, you just adapt your tactic to tactics of other players. LOL - The person who wrote this article must be old as dirt ! Like me , I grew up with the saying "If you can't find them , grind them "
Having said that , anyone who plays the same way , always raising preflop , no matter what their cards are , or always "calling "
Those ways will just get you eaten to the point you will have no stack left and out ... So, I agree you need to change it up, and before you are out of chips ! I agree , you need to know what your style is and how to change it. I still feel that you need to watch the cards coming out , and you will notice a pattern , and try to play accordingly. I have called or even raised on what I feel is a good hand , only to have crap flop out ! Yes , I have had to fold an A and a good kicker ! Good article. Your image on table -is very important and often it can and should be used. For example, if you are a tight (neat) player then the possibility of bluff-3-beta against a suitable opponent (with a high frequency of Fold to 3-bet) is a good solution. Playing a tournament I try to change the gear when I am the chip leader at the table or at the bubble stage. It is then that the players begin to play more tightly in order to hold on to the tournament for as long as possible and reach the prize money. This is an ideal opportunity to capitalize on and pick up several banks without resistance, which will increase your stack. There are so many good ideas that people have posted here! So many ways to "attack" this 'cat and mouse game' against other folks. Different personalities, habits, table positions, type of hands, how much is my stack?, how much is the other people in the pot's stack?,is that short stacked guy gonns go all-in?, LAG and Tag, cat and Mouse, suited cons, small pairs, late position, always raising PF, not always raising PF. Through the hundreds of hands we play, guess it's a good way to practice multi-tasking, huh? As pros, we get so use to running these thoughts through our minds, that it is taken as second nature. Thank you for the article, Tammy. It helps to add more focus to those things and to know that we are on the right track when comparing our thoughts to each other and what we should be thinking. Another essential article to learn more about poker strategies. Basically what most influences me in this change are the levels of blinds, stack size and situations like bubble and ITM. Very good topic, I believe it will open the minds of many players. I particularly try to fit the table and maybe have a more aggressive game, but I'm changing it, I've been studying stacks to improve myself. It's a good idea to play a bit more loose with suited connectors and pocket pairs, but I believe you also need to study for a good post-flop. Suppose you do not have a healthy stack and end up paying with a low pair, or even a raise. On boardy you come all bigger than your pair, how would you play? With the suiteds connectors, evaluate the gameplay and post-flop alncance, before paying a hand ... Paying to just hit, I believe to be a crime. As the last part informs, always ask yourself. Self-inquiry will add more chips over the years! I created a topic that has to do with the content, we could start a new conversation about strategies here. A good article from which I learned that in poker, you can change gears by changing your style of play from very aggressive to defensive, from clock to loose, from bluff to game without bluff and in the opposite direction. The purpose of this gear shift, I understand - to confuse the opponent. You need to switch gears only to confuse your opponents or to improve your image. And there is no other reason for this. I also want to add that when you play in high gear and control the game ... you should never lower the gear in order to play a good hand more deceptively. Just keep betting and raising. Take full advantage of your aggressive image for as long as it works. That's a very good point! I wonder how (or if ) it would work on the micro tables? This is so true. Getting too "tricksy" can end up being a detriment to you for sure! Yeah, I hear you, I can get quite spewy myself. Gets me in trouble a lot! After reading the article, I really realized how important it is to switch gears especially in tournaments, not that I would not pay attention to it before I read the article I tried how to apply gear shifting, but to be honest I did it in not quite suitable situations. Now I will try to heed the advice in the article and put it into practice. But still to create some kind of image is quite difficult in the presence of opponents XM2 and Pokertracker 4. I enjoyed reading the article and thought it was well written. Great job. I think someone already mentioned some bubble play, and I would like to add that there is a bubble that is not for the money, but for playing the next day in a live tournament. Also I think there could be some mention of how full the table is that you are sitting at. Sometimes in a tourney, your table turns into something more like a 6 max (or may suddenly turn into a full table when all the players are reshuffled). There is definitely a case for changing gears in this case. Another minor point, sometimes in a tournament, someone gets seated at your table with starting chips indicating a late registration (so it is a good idea to know what the late reg period is). Looking at the possibility of someone coming in and being bingo, it might be advisable to tighten up. A word of warning. "Switching Gears" to a playing style you don't know how to play isn't switching gears, it's veering into oncoming traffic. Make sure if you switch to a new style of play that you actually know how to play that style. Learning a new style can be done by playing freerolls or low stakes in nothing but that new style for a while until you are comfortable playing it. If you have no clue when to fold or raise 9To then switching gears into a 9To hand is going to break you. Also, you have to remember it takes time to build up your table image in order for a gear shift to be effective. If you only play 1 orbit tight before switching gears then odds are the people at the table don't really know you're a tight player. Also, if you've been playing tight for 30 minutes and then switch tables, the people at the new table know nothing about your table image at the other table. Don't get caught switching out of your comfortable playing style when the table doesn't have an image of you yet. Finally, it would probably be absolutely the best if you had 3 styles of play in terms of tightness and started out in the middle style so you can choose to either up or down shift on-the-fly. I haven't developed this skill yet, but sounds good in theory. The article is very useful.I myself tried something like this recently.I had some success. But the game of cat and mouse is dangerous. Very well remembered. Nice job friend! First of all it is worth studying the fairness of the ranges of openings along with what you want to open or even how to change the gear. Play and justify that it was for feeling, it will not help you to evolve. Reflect on the topic and seek improvement. Have you stopped to read the topics here? Of course it pays to use valid information, but whenever you have questions ... ask !!! Tammy this is a great article I use this every time I play I start off A SNG or tournament using suited connectors and one gappers and as blinds go up I tend to tighten my range do to stacks to blind restrictions and BB getting shorter as blinds going up making cost of poker go up the deeper you get into the tournament so that makes me thighten up my hand requiements shifting gears to the top of my range of course. In order to switch from TAG (aggressive-aggressive) to LAG (free-aggressive) game style was successful, you must not only own these game styles. You should also be well aware of what other players at the table think about your usual style of play. Only if they know your usual style well, and think that you play it, will it give a good switching effect. A simple example is that you can begin to steal blinds more often, with a wide range of hands, if your villains believe that you only play your best hands. Conversely, you will be more likely to play with stronger hands if you know that you are playing very widely. Changing the style works if your style is known. find it possible to be. player poker without using the famous huds? say this because I believe I play well even without huds but I think it's unfair against those who use them. Thank you very much for this excellent article, where it says are quite right, you do not always have to esperare premium hands often can take advantage of your table image and open your range. It is also true that we must control our stack, and villains, often forgotten me, this article is worth reading a couple of times. Excellent article, I think it is the first forum to address the subject. I see some professional players warning about this point, but I really think it's the first forum post. Well, I think this is an important action to take. Using as an example, the January monthly challenge, early in the tournament I was the chip leader of the tournament getting a little over 5 ~ 6 times more chips than the second in my table rankings. With the blinds in the beginning made me play 70 ~ 80% of the always aggressive hands but watch out for all the actions. This made my chip chart go to a grand ancestry. I kept this game until semi FT because at that moment I had to change gears, because the 2nd and 3rd went to my table, where they both had a little more than half of my stack, putting my life in the tournament at risk. In short, when I am deep, I try to play as many hand as possible, eliminating only hand rubbings. Situations like these are to be explored, but we need consciousness to know exactly when to slow down . If we are talking about tourneys not changing gears is suicidal. You should play differently based on antes, how much blinds you have, how close you are in bubble, whats your table and your position. If someone dont manipulate their image when they have competent opponents who keep notes, but keep playing they same is the same as never bluffing in poker. Foolish. I start changing gears when i know already sold my image to the table. This article made me adjust my range about playing suited low connectors, when i had position and saw weakness i used to play like 6 being my top card, sometimes worked, but it cost me everything hitting a weaker sequence yesterday at CC's tourney. I'm having difficulty at changing gears during the late stages of tourney, one error can cost half of your stack, but i hope that i'll adapt better to this situation with the help this article. Thanks ! this article will be very useful for me. since I do not know how to switch, now I will learn this new strategy for me. time will show how it will affect my game. Thanks. Oh, I found out that I must be pretty predictable. My opponent can take note on me so I should change my style of play more often. I will try to do it , by reading those articles is very helpful for my game improvement overall. The more you read about poker strategies the more confused you get and you understand how fish you are. Unfortunately I have nothing to add to the article , very informative. Simply shifting gears randomly to throw you opponent off and to mix up your play style is not a good strategy. You must take into account you surrounding and your table image as well as the blind structure and effective stacks. The easiest way of gear shifting is doing so in mtt. Early on you play loose see a lot of flops. As the tourney goes on you tighten up. If you have a big stack at bubble you may choose to play LAG if small stack TAG. 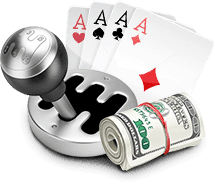 You can also shift gears while in hands this particularly useful for pot limit games and for cash games where in the latter the blinds do not increase. I definitely do change gears. I play aggressively at the beginning of a tournament and then tighten up as my stack nears 20-25 bbs or as the bubble approaches if my stack is around 30-40bbs. I do find once I tighten up is hard to switch back to playing aggressive, I guess this is something I should think about more so I don’t get complacent. I always change gear at a subconscious level in anxiety from the circumstances at my table. Need to play in such a way as to confuse the head of my rivals and be with them and win the situation.